There is growing evidence that even brief (5 days −8 weeks) meditation programs may improve neuropsychological, metabolic, and clinical profiles in a range of populations. Studies show meditation reduces stress [26, 30, 33], anxiety [28, 31, 33], and depressive symptoms [33–35], enhance quality of life [30, 34], decrease sleep disturbance , cognition , reduce sympathetic activation, and enhance cardiovagal tone [27, 36]. Most recently, 10 people with mild cognitive impairment or early-stage Alzheimer’s disease and their live-in caregivers meditated for 11 minutes, twice daily for 8 weeks. Results of this study showed decreased perceived stress and depression. Also, improved mood, sleep, retrospective memory function, and blood pressure were demonstrated. This supports meditation programs as effective self-care strategies for BOTH persons with neurological disorders and their caregivers. The benefits for sleep and mood are especially important, given the high prevalence and negative impact of chronic stress, sleep disturbance, and mood impairment in these populations. What I love best about this study is that is benefits BOTH patients and caregivers… and is something you can do TOGETHER. Strengthening not only self-care strategies, but also perhaps relationship quality and shared experiences. What are you waiting for? And for some tips on how to begin a meditation practice, check out this Tutorial: Meditation 101 (click on link). much love. 26. 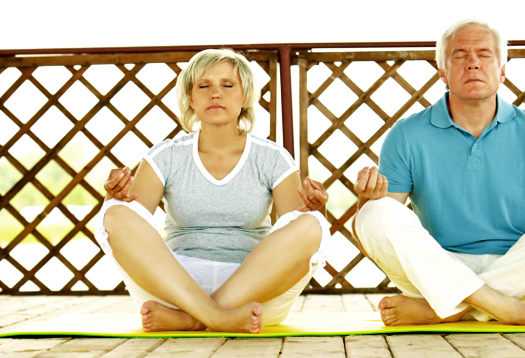 R. Bonadonna, “Meditation’s impact on chronic illness,” Holistic Nursing Practice, vol. 17, no. 6, pp. 309–319, 2003. 27. K. E. Innes, C. Bourguignon, and A. G. Taylor, “Risk indices associated with the insulin resistance syndrome, cardiovascular disease, and possible protection with yoga: a systematic review,” Journal of the American Board of Family Practice, vol. 18, no. 6, pp. 491–519, 2005. 28. R. H. Schneider, K. G. Walton, J. W. Salerno, and S. I. Nidich, “Cardiovascular disease prevention and health promotion with the transcendental meditation program and Maharishi consciousness-based health care,” Ethnicity and Disease, vol. 16, no. 3, supplement 4, pp. 15–26, 2006. 30. T. K. Selfe and K. E. Innes, “Mind-body therapies and osteoarthritis of the knee,” Current Rheumatology Reviews, vol. 5, no. 4, pp. 204–211, 2009. 32. L. E. Carlson and S. N. Garland, “Impact of Mindfulness-Based Stress Reduction (MBSR) on sleep, mood, stress and fatigue symptoms in cancer outpatients,” International Journal of Behavioral Medicine, vol. 12, no. 4, pp. 278–285, 2005. 33. J. D. Lane, J. E. Seskevich, and C. F. Pieper, “Brief meditation training can improve perceived stress and negative mood,” Alternative Therapies in Health and Medicine, vol. 13, no. 1, pp. 38–44, 2007. 34. R. Jayadevappa, J. C. Johnson, B. S. Bloom et al., “Effectiveness of transcendental meditation on functional capacity and quality of life of African Americans with congestive heart failure: a randomized control study,” Ethnicity and Disease, vol. 17, no. 1, pp. 72–77, 2007, erratum appears in Ethnicity and Disease vol. 17, no. 3, page 395. 35. V. K. Sharma, S. Das, S. Mondal, U. Goswami, and A. Gandhi, “Effect of Sahaj Yoga on neuro-cognitive functions in patients suffering from major depression,” Indian Journal of Physiology and Pharmacology, vol. 50, no. 4, pp. 375–383, 2006. 36. J. P. Manikonda, S. Störk, S. Tögel et al., “Contemplative meditation reduces ambulatory blood pressure and stress-induced hypertension: a randomized pilot trial,” Journal of Human Hypertension, vol. 22, no. 2, pp. 138–140, 2008. As a PWP I must agree and encourage others who do not meditate or practice some form of relaxation technique to please do your self a favor and do so. I meditate, stretch and pratice my breathing every morning in an effort to fight this wicked PD, I cant say im winning but I feel 100% better for trying. That’s great, Benjamin! Being present and in your body (and out of the judgmental mind!) is a great tool for dealing with chronic diseases. Thanks! I benefit greatly from meditating. It relaxes my muscles, clears my thoughts, reduces anxiety & gives me time to tune out the world and enjoy much needed rest. I usually feel refreshed after a session. My favorite free online source is the guided body scan by Greg DeVries.